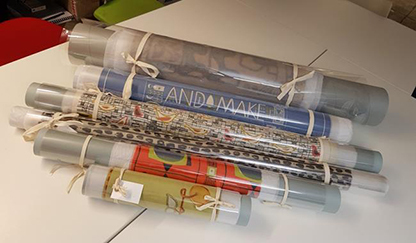 Archives and Collections have just finished a large textile repackaging project, linked with the textile digitisation project we wrote about in our recent blog. This project was completed with the hard work and enthusiasm of six student volunteers from the University of Glasgow’s Centre for Textile Conservation. We have been repackaging the textiles to protect them for current and future generations and allow for easier retrieval from storage. The transparent packaging also allows the textiles themselves to be seen whilst still packaged, giving visitors an instant flavour of the works. The packaging approach we used for the textiles is to roll them onto tubes, as demonstrated by Susan Heald, Textile Conservator at the National Museum of the American Indian at the Smithsonian Institution. The rolled textiles will then be placed onto spindles and into plan chests, the approach adopted by the Smithsonian. Our textiles have been rolled onto six standard sizes of tubes, of varying diameters and lengths, from slim tubes for fine materials with no embellishment, to the longest, widest tubes for thicker, wider textiles with buttons and beads. The process of rolling the textiles was explained and demonstrated to us in a training session at the start of the project by Tuula Pardoe from the Scottish Conservation Studio. All the students – Kayla, Andrea, Izzy, Viviane, Caterina and Anaka – got the chance to have a practice run before we got started on the large list of textiles which awaited them! The textiles were rolled onto the tubes using a tissue paper leader to pick up the fabric, then covered with a layer of Melinex polyester, before being tied with tape and labelled. The packaging products are conservation grade and acid-free, to prevent deterioration to the textiles and preserve for the long term. The rolling project allowed both myself and the students to get a real flavour of the depth and breadth of the collections. We had frequent conversations during the rolling about how long it would have taken to make each piece, looking at the detailed features and intricate handiwork, and how well the items have survived often hundreds of years. Faded colours where the fabric has been exposed to the light, and signs of wear and tear, tell a story in themselves. Another common theme was that many older textiles have a very contemporary feel, with designs from the 1950s feeling especially fresh and current, and quite at home in a modern setting. It would be unfair to highlight favourites within the collection, especially as these favourites changed each day as we rolled new textiles, but a number of textiles will definitely stick in my mind, for their choice of gorgeous colours, bold designs and painstakingly executed needlework. Accompanying the textile rolling has been a rigorous data management exercise to ensure all 174 rolls have been logged, and matched to the accompanying digital image for an ongoing photo label task. It has been a privilege to work with both the textiles and the student volunteers, whose knowledge, care and enthusiasm for the textiles they were working with have been a credit to them. The digital images of the textiles will appear soon on our new catalogue, or why not arrange a visit to our reading room to see them – we hope you love them as much as we do! You can find out more about the Centre for Textile Conservation on their blog or follow them on Instagram.